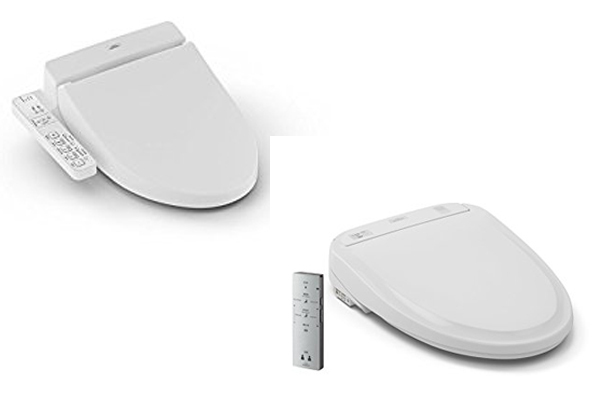 TOTO is famous for their top of the line toilets, but they offer bidets seat of the best quality as well. The comparison of TOTO Washlet S300e vs 350e isn’t an easy task because both products have impressive feature and upgrades and can be easily integrated in any bathroom design. Washlets come in white and beige which make them look elegant and even luxuries. The seat temperature can be adjusted and it come with a convenient LED light that makes night trips to the bathroom so much easier. The water heating on both device is instant and tankless, which means you never have to worry about running out of warm water. The newest and the most impressive feature is probably e-Water technology. It’s based on electrolyzed water, designed to keep the need for harsh cleaning to a minimum. Water pulse mode is automated and it moves the nozzle back and forth providing a wider cleaning area. Both Washlets are eco-friendly and they waste the minimum amount of water during flushing. The remote devices could be customized to be used by two persons. That means couples could just press a button and adjust the seat and adjustability because it comes with an automated seat and lead opening and closing. This makes it a better model for man. Washlets have a magnetic wall mounted cradle, which makes installation simple and straightforward. TOTO Washlet are the best in the field, with a variety of functions and adjustable features. They are easy to use, clean and maintain, but in S300e vs S350e comparison the latter one takes the prize, just because It’has an automated seat opening. However, both would make a great addition to any houseold.